Prescription Center Pharmacy is a locally-owned pharmacy that renders pharmacy services to all of the Hudson County communities. Our doors have been open for 53 wonderful years. The current ownership and management has been overseeing operations since 2001. Since the beginning, we have found fulfillment in what we do and how we help shape the health of the community we belong to. Our Compounding Pharmacy in Union City, New Jersey has the most reliable, safe and effective brands of health products and essentials. This way, we will be able to help maintain and improve the lives of our customers. 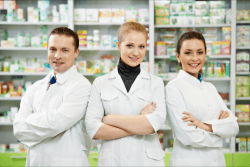 At the same time, we also deliver quality services, from refilling your prescriptions to fax services, fueled with professionalism and dedication. To continue to serve with passion and dedication by providing innovative pharmaceutical products and services that are high in quality but amazingly low in price to enhance the health status of the diverse communities we serve. We will continue to be the leading source for safe and quality drugs, outstanding customer service, and comprehensive drug education to our customers. Our vision is to be the pharmaceutical health care provider of choice in Hudson County. Our friendly and responsible staff can assist you with your needs. Visit our store today, or you can call us at 201-864-2004 or 201-864-2005 for your inquiries.